Though there’s a new eatery in the neighborhood, its proprietor is anything but a stranger. George Abou-daoud’s newest venture (The Bowery, Rosewood Tavern, Township, The Mercantile) does not actually include a liquor license. Instead, you’ll find fresh Lebanese made from scratch. 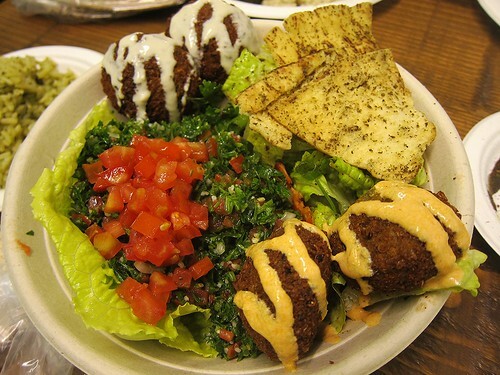 Your trusty Mediterranean selections like babaganoush, lebneh yogurt, organic chickpea & quinoa falafel, tabouli, fattoush salad, vegetarian kibbeh, lentil mujadarra, stuffed cheese rolls, fried cauliflower can be found at Urban Garden for an average combo price of $9-$15 a pop. It’s a great addition to Fairfax Village, at once metaphorically and physically across the street from mainstays as historic as Canter’s and iconic as Animal.